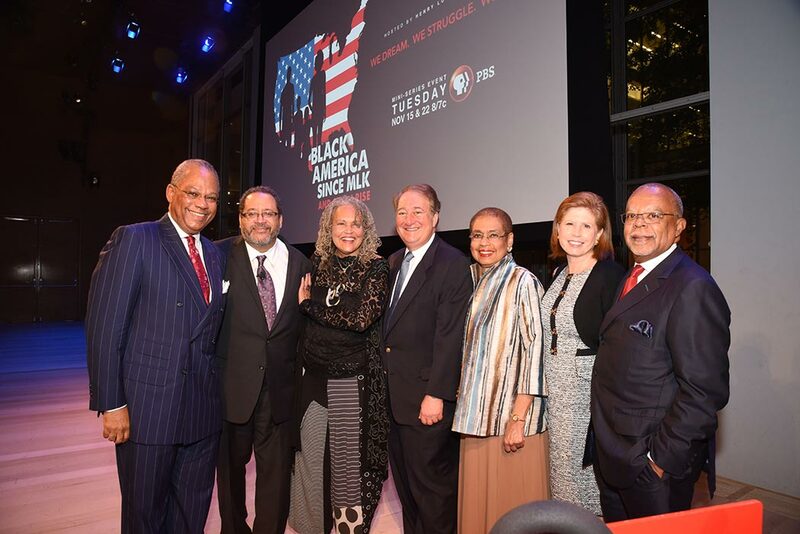 At an evening reception and screening hosted by the Howard and Abby Milstein Foundation at the Times Center in Midtown Manhattan, major civic and civil rights figures celebrated the newest Public Broadcasting Service (PBS) series by Emmy- and Peabody-award winning Harvard Professor Henry Louis Gates Jr., Black America Since Martin Luther King Jr.: And Still I Rise. Black America Since MLK: And Still I Rise is a two-part, four-hour documentary series hosted, executive produced and written by Dr. Gates. The documentary will premiere on PBS stations nationwide on November 15 and 22, 2016, at 8/7 Central Time. Among the leading supporters of the event were the Howard and Abby Milstein Foundation, in partnership with HooverMilstein and Emigrant Bank. Black America Since MLK: And Still I Rise looks at the last 50 years of African-American history, moving from the sanctified past of the civil rights movement to the complex and conflicted present. The series charts the remarkable progress of the African-American community while raising serious questions about the obstacles that remain. Dr. Gates’ program offers a fresh examination of key events and turning points in American race relations and black history since the mid-1960’s, animated by viewpoints that have rarely been heard on television, ideas that are not often said out loud, and questions that many are afraid to ask. The reception and screening were followed by a panel discussion with Rev. Calvin O. Butts III of the Abyssinian Baptist Church, journalist Charlayne Hunter-Gault, academic and radio host Michael Eric Dyson and Congresswoman Eleanor Holmes Norton. Dr. Gates said: “How has the black community changed since the Civil Rights Movement? Since Martin Luther King Jr. died? How would you describe the tremendous progress we have made, but also the enormous challenges that far too many of us still face? How could this be the best of times and the worst of times for Black America? These are the questions that this series explores. Also joining the Milsteins at the event were Arthur O. Sulzberger, Jr., Chairman and Publisher of The New York Times; Sharon Percy Rockefeller, President and CEO of WETA in Washington, D.C., the flagship public television station in the nation’s capital; and Paula A. Kerger, the President and CEO of the Public Broadcasting Service. The new series is produced by Inkwell Films, McGee Media, Kunhardt Films and WETA. Additional support for Dr. Gates’ new series was provided by Bank of America; Johnson & Johnson; the Andrew W. Mellon Foundation; the Ford Foundation’s JustFilms; the Corporation for Public Broadcasting; and public television viewers and PBS. 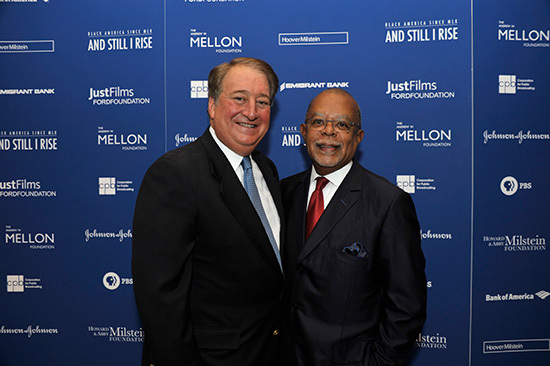 Howard Milstein and Professor Henry Louis Gates Jr.